Get access to the UK's best vehicle finance providers offering the best, tailored finance quotes to suit you on this new Jaguar F-PACE car. 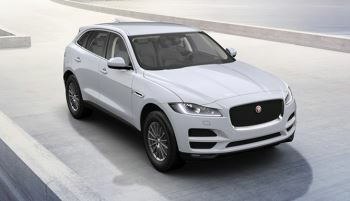 The new Jaguar F-PACE is charging in to fresh territory for Jaguar, it is the companies first 4x4. The F-PACE has been designed to stand out from the competition using Jaguar's unique blend of engineering excellence, technological advancements and high quality workmanship. The F-PACE was designed from the ground up with the starting point being the extensive use of aluminium throughout. This backed with a range of new engines that you will also find in the XE & All-new XF including the new Ingenium engines which provide high power outputs along with lower CO/2 and higher MPG. From the outset the F-PACE was designed to delivery sports car handling in a larger 4x4 body. Jaguar have used all of their experience in designing their performance vehicles including the F-TYPE, XFR & XE S.
The external design bares the now very familiar Jaguar lines, but with the largest frame Jaguar have every worked with this blends to a more robust appearance. The interior borrows from the XE and the all-new XF and gives you everything you would expect from a premium SUV, but with the extra refinement that all Jaguar cars have. This includes the highly praised Jaguar entertainment system and big list of driver aids that can be added to enhance your drive. The best way to decide the car is for you though is to actually drive it and see what all of the fuss is about. There is a form at the bottom of the page where you can book an appointment. You will be assigned one of Sales specialists who have been extensively trained on the F-Pace. They will be your guide through the whole process from test drive to ordering and will happily answer any questions that you may have. We also strongly recommend looking through the options on the Jaguar F-PACE Configurator Page on the Jaguar website. This will allow you to look through all of the options available to you and also allow us to talk through the options you want in greater detail and highlight options of interest during a test drive. Click here to see all our featured latest Jaguar Offers.